I am sorry to have been absent for this past week. My husband had a little medical scare, so I was busier than I had imagined I would be during this first week of school vacation. I think things are pretty much back to normal now, so I am continuing to wash skeins and skeins of wool. Fallout from the Great Wool Moth Invasion of 2014. Eek. The only way to make sure that no eggs are left alive in wool is to wash them at a certain temperature water with soap. So I am. It’s not a heinous project, as I enjoy being home now that school is out. 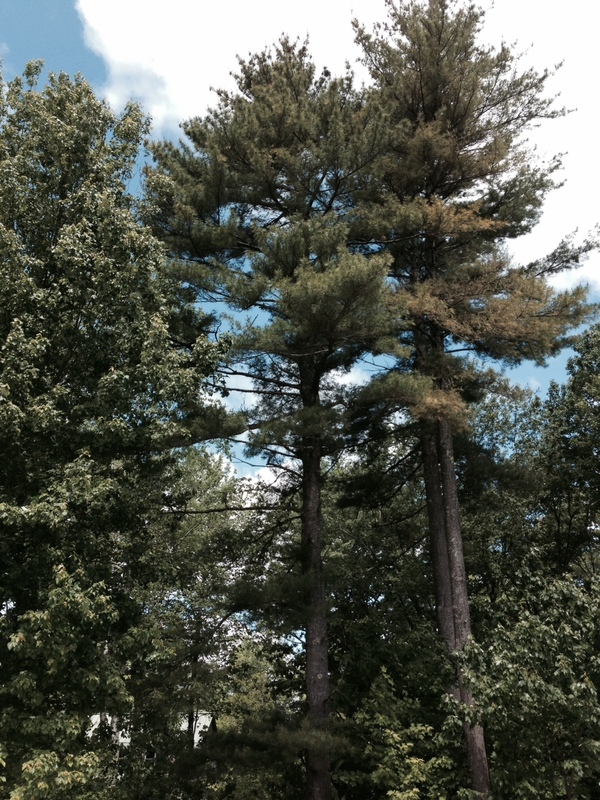 The weather has been perfect: breezy and not too hot. Just right. I have gotten a slew of stuff done since last Friday, and I can say that I am on the winning end of the deal at this point. 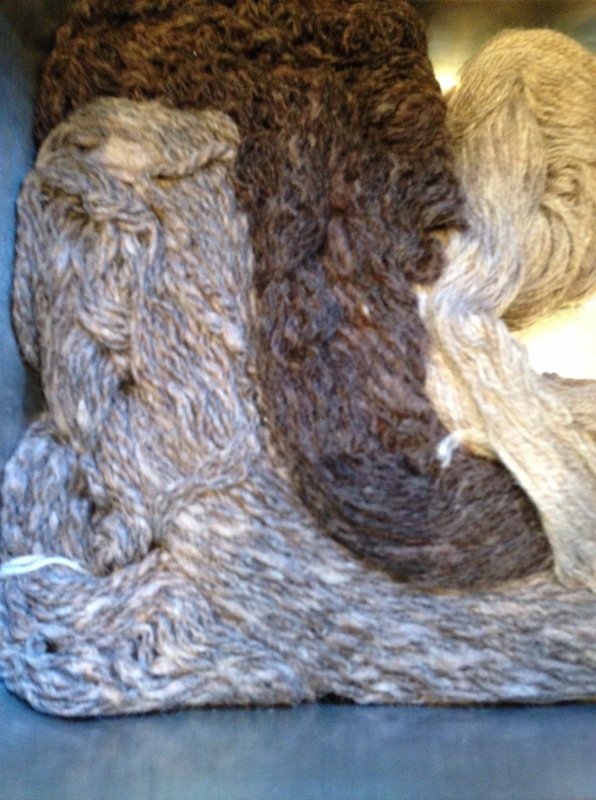 And, as a bonus, in the big cleanout I came across a box of some handspun that I am very happy to have found! Aside from the wool, the goats are offering up some very good entertainment, even though Bagels tripped me Tuesday night and I think I sprained a finger on my right hand. (I had my hand through his collar and he wanted to go one way, I was going the other way, and we landed in a heap, jamming my fingers in the process.) Ah well, such is the life. 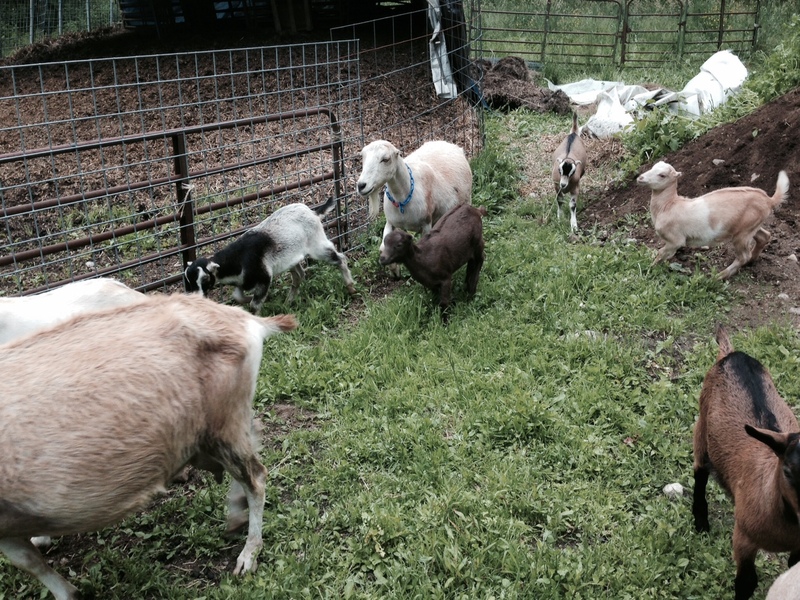 But in general, when I am home during the day, I can open up the goat paddock to a very weedy, grassy area, so they are going great guns on that. We have a loam pile right in the middle of this area and the kids are very engaging as they jump and do back flips onto and off the pile. The best King of the Mountain game yet! This weekend looks totally gorgeous, and I am looking forward to the good weather. More haying on the schedule, I think. We are a little late, as usual. 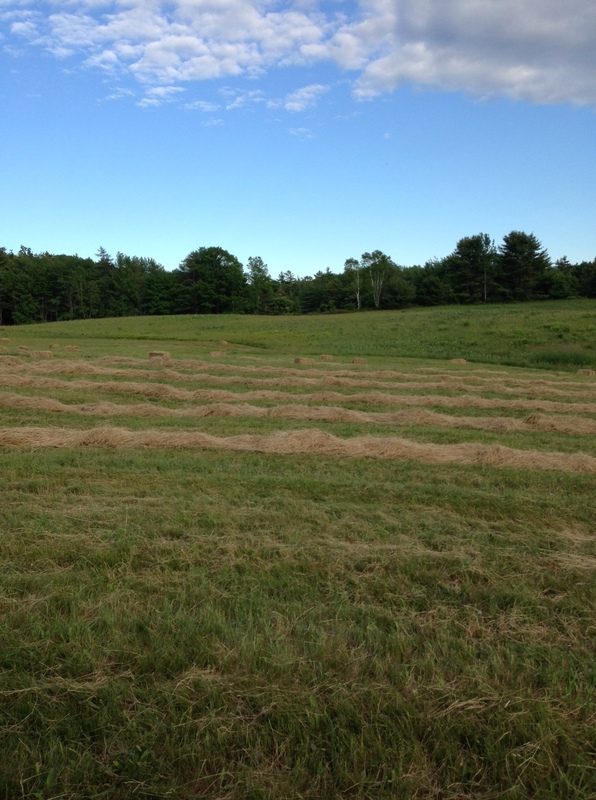 The hay down in the field was ready two weeks ago, but last week John finally got the equipment working and got cutting. Of course, we had gotten 2.5″ of rain two or three days before that, and I don’t think John knew how wet things were going to be. And then the equipment went down, which we could have predicted! 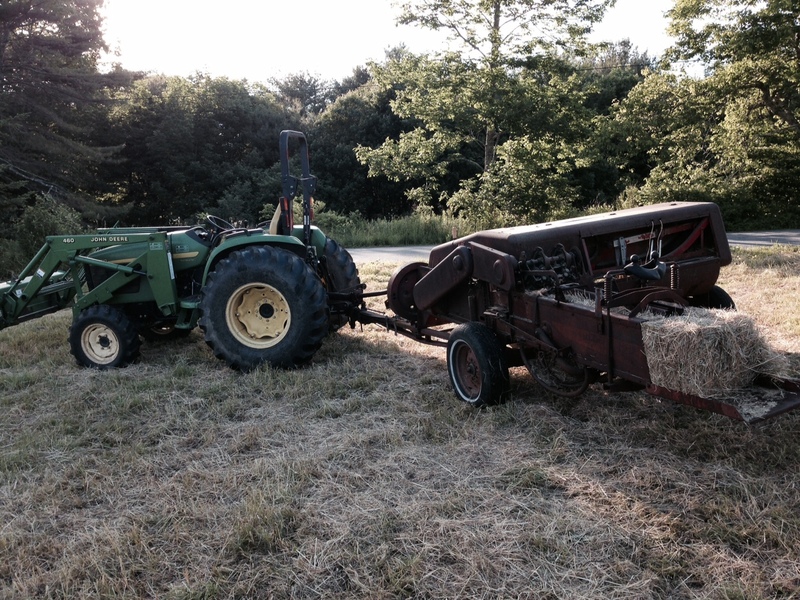 The vintage of our haying equipment averages from the mid 1960s if we are lucky. But it’s solid stuff, and with a parts machine or two, John can usually get things moving again. Yesterday he worked almost all day on the tedder. And then today he finished up mooching parts from another one, and off he went to tedder, winrow and bale. I went down this afternoon with the pickup truck to start going up and down the rows so that he could throw the bales in. I can take them off the truck, but have trouble throwing them up into it. I guess I am too short for the F-350! Luckily, he called some folks from work and they came down to help us load it up and haul it off to storage. It’s mulch hay, so it’s not coming to our animals. Hopefully in the future we will be making it for ourselves. So another weekend has come and gone, and tomorrow is my real first day of not working, and since John is going to work, it will feel like it’s really summer. 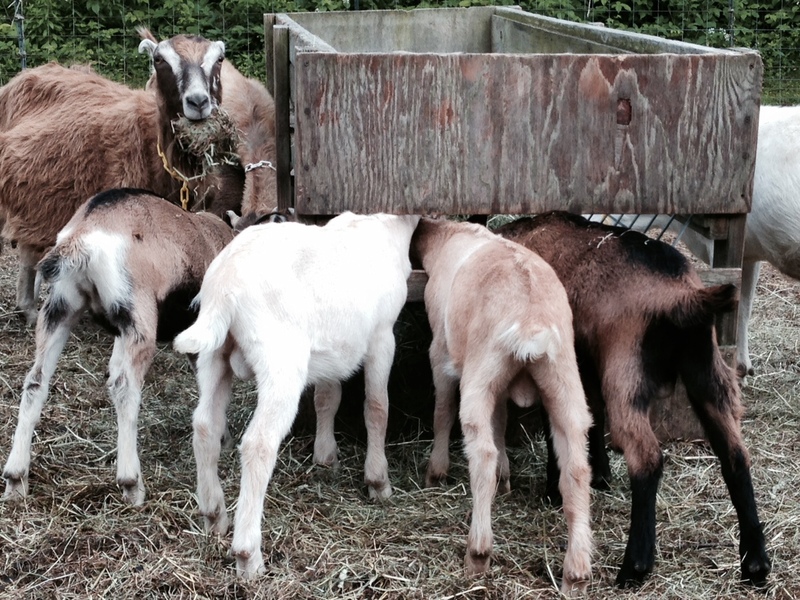 Goatie butts around the feeder. Elf is looking on! First day of summer vacation. Awesomely wonderful even if I had to take my husband for his 10 year colonoscopy! It wasn’t work, so that was a thrill. And I got him up at 4:30 a.m. (15 minutes past my usual wake up) and then went back to sleep until 6. Heavenly! The weather has turned very cool and sun and clouds are out there. I don’t mind the below normal temps at all. Makes it a lot easier to do chores (although I am very happy to wait a long time for the winter’s return!). 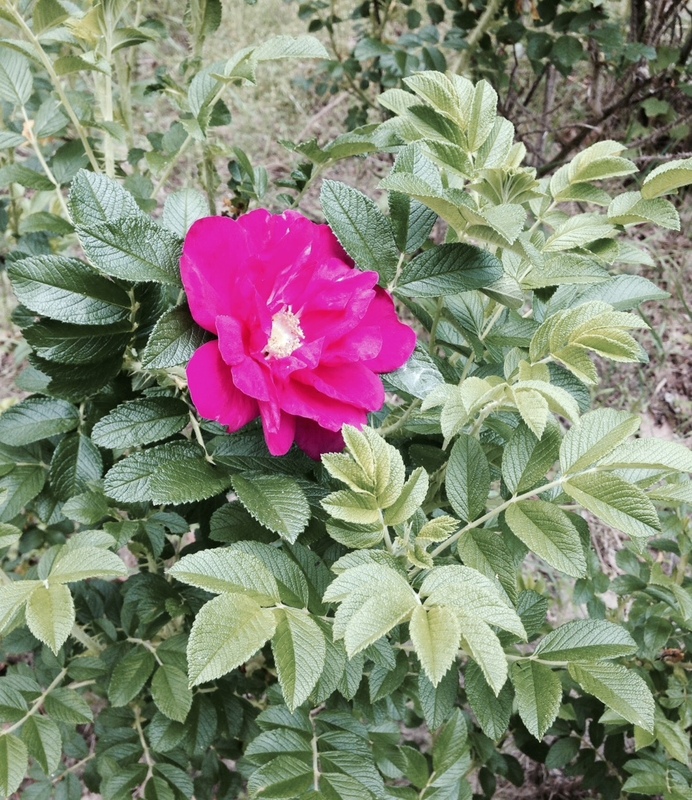 It’s green and beautiful outside and some of my rosa rugosas are blooming. All’s right with my little corner of the universe today, and I am grateful. Never get tired of the summer sky view! Sunday, as advertised, was spectacular. We scurried around and got as much done outside as we possibly could. 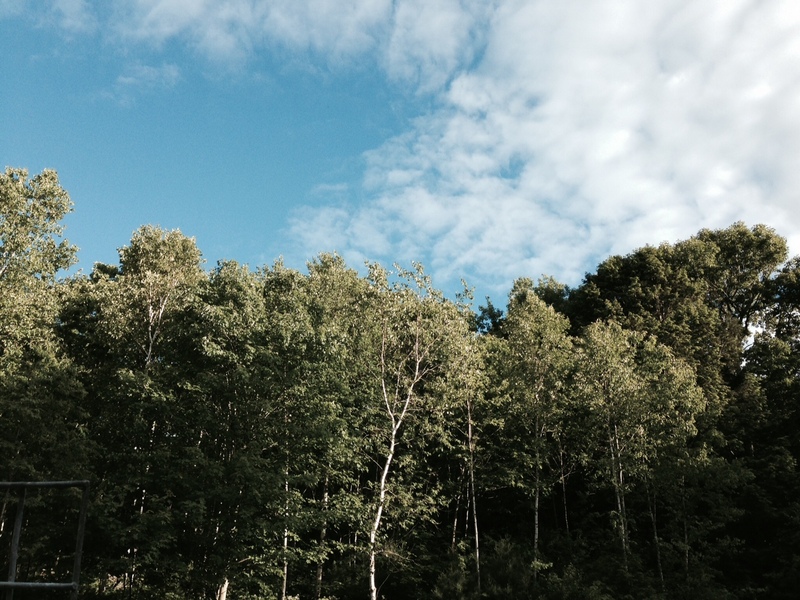 The sky remained a fantastic blue, and the clouds were phenomenal and quickly moving. I did mega loads of laundry, and on one of my trips outside to drape something over a drying rack, I almost ran right into one of the springtime sojourners on the farm: turtles, of course! 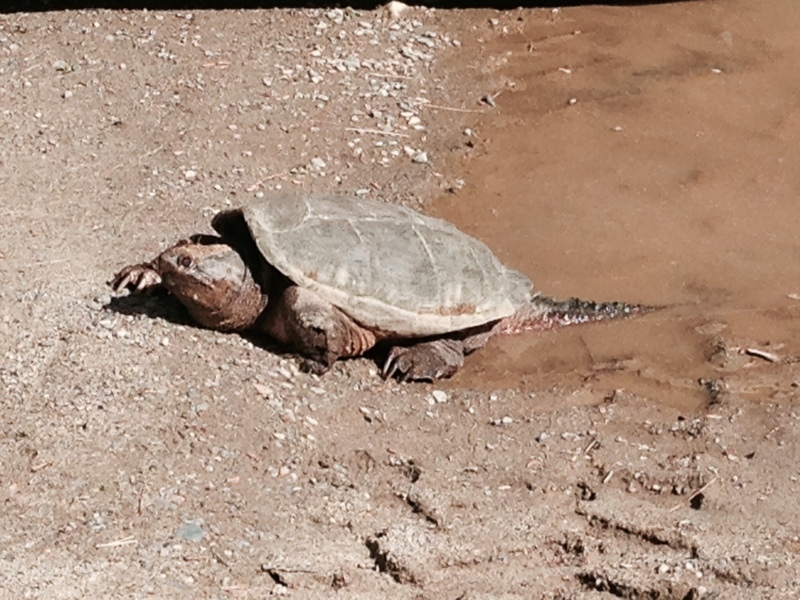 I love finding the painted turtle mamas making their way along the driveway and around the side of the house, but this time, I almost walked right into the path of a very large snapping turtle. Eek! I don’t mess with them, I give them a wide berth. So I backed up, and then decided to take her photo. She was right in front of where I park my car. And the day after we saw that there is a lot of dirt dug up near the garage. I don’t think she laid her eggs in that hole, but I guess she was testing it out. 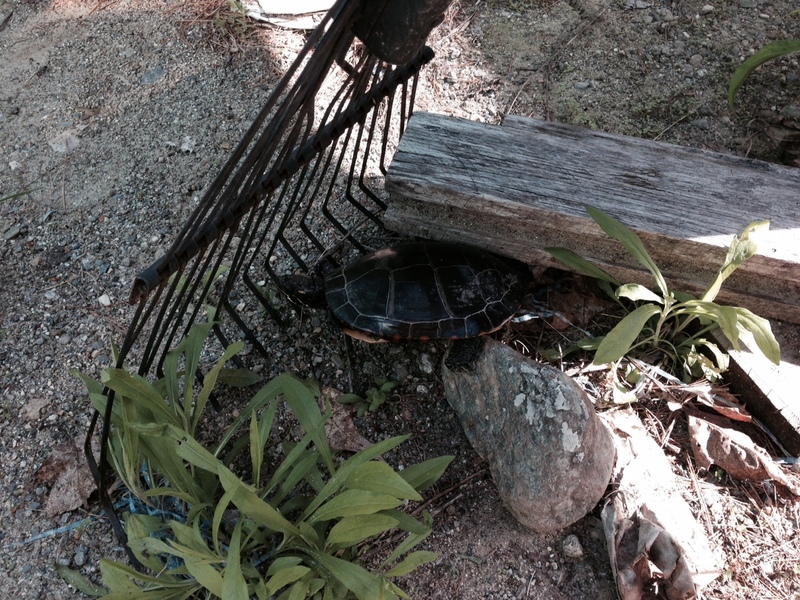 It’s definitely the time of the turtle here in coastal Maine. Before the end of the school year! I can’t believe that last year this time we were already out, but then on the other hand, last year I had hurt my back really badly and wasn’t doing much of anything at this point. Today the weather began morphing from very cool and rainy to humid. During the day we could feel it building. 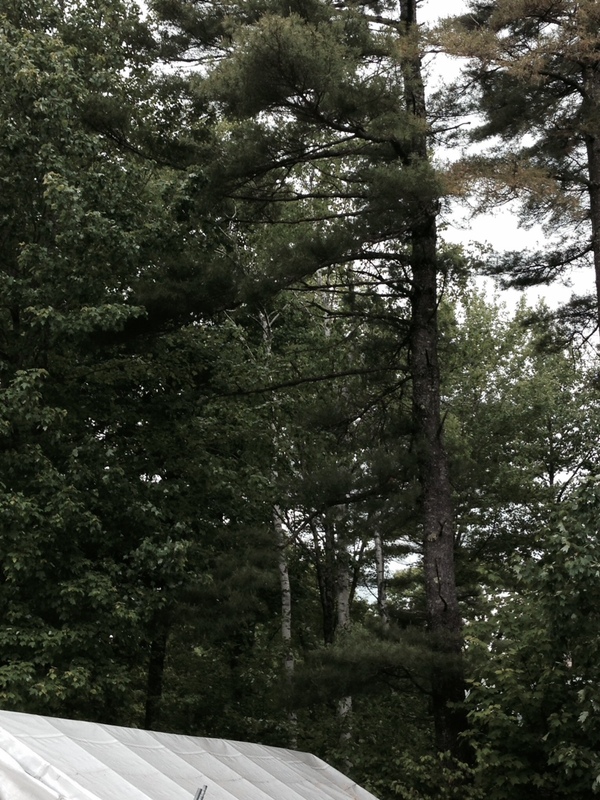 The deluge of rain began yesterday afternoon and continued overnight (2.3″), and now we are seeing alternating grey skies and dappled sun through the trees. It’s time for a warm-up, and moving toward July always means humidity here. And so it goes. A highlight of the weekend so far is that we had a wonderful overnight with our grandboy, and mud puddle play featured large in our day. He wore me out with frisbee and ball-tossing into the puddles, and then he found a baby painted turtle in one of the biggest puddles. 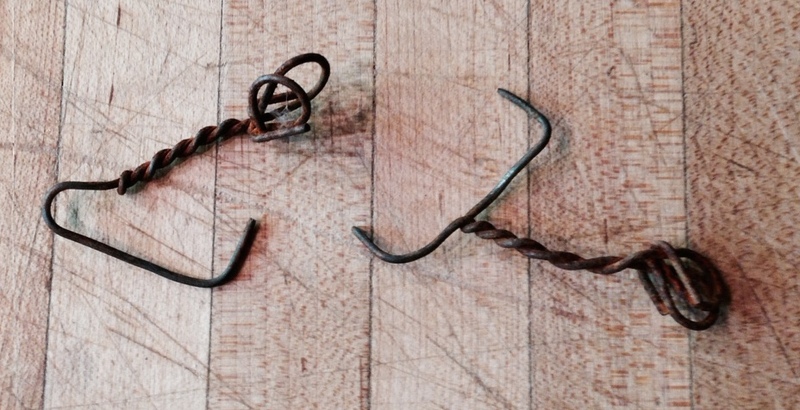 I thought I was going to get the refrigerator cleaned out and some fences mended, but am barely halfway there. It’s okay, we ended the day by having a romp with the goat babies and then flying the pigeons. They only stayed out for 20 minutes. I don’t know if the barometric pressure was weighing on them, or if they just wanted their dinner, but they didn’t do any high flying at all. Tomorrow should be a winner of a day. Warm and sunny. Maybe I will get to the rest of the tasks I had on my list. And then 4 more days of school. Wow. I think I blinked and this year has gone by. The summer is winking at me and I hope that I enjoy every minute of it! 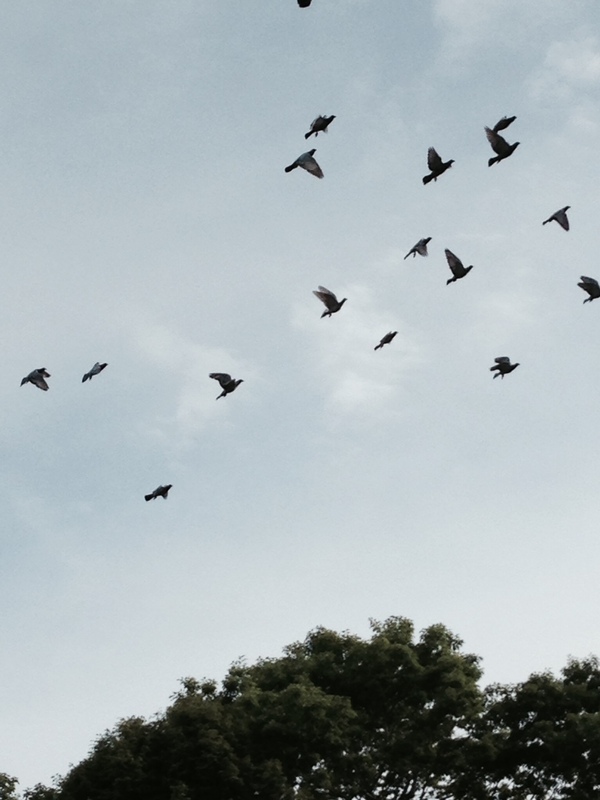 Hard at work every day, those homing pigeons get their exercise flights. Now that they have been flying regularly for a few weeks, we can expect most of what they are going to do. On their first flight, we could barely get them into the air and away from the loft. They were out all day perched in the trees around the loft because they were unsure of how to get back in. Now they are going out, flying hard, and then returning about an hour later. 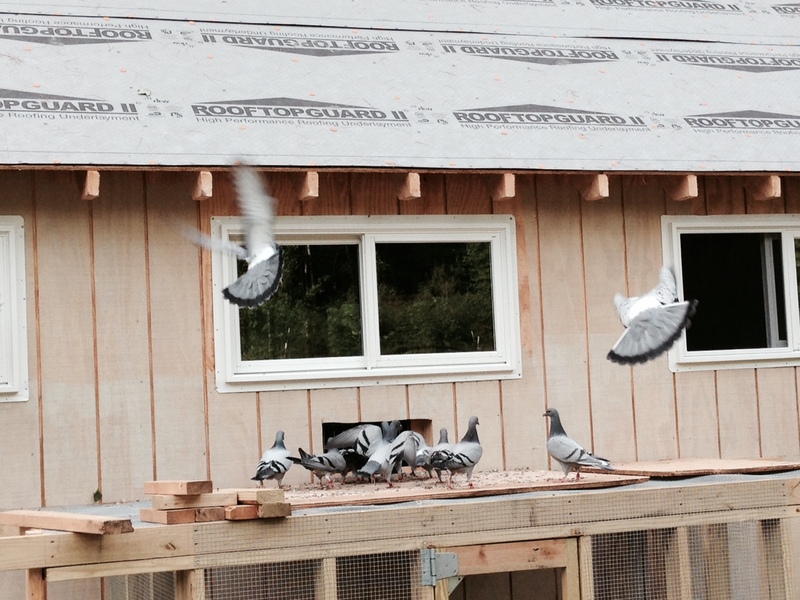 They land on the ridge of the loft roof, and then one of them leads the group down to the one-way-in door. Some nights they practically trample each other to get in to their dinner. When I watch them in the air and they are flying pretty close, they look so silly. Little round bodies and short wings. I don’t know how they do it, they are amazing! Soon it will be time to take them in a crate to a spot down the road, so we can let them loose and see how long it takes them to get home. The pigs are definitely flying! The weather sounded iffy today, but it turned out to be okay. I spent some good time with the goaties this afternoon. Marigold and Iris can’t stop climbing all over me, and the others are beginning to be a little more comfortable as well. Love those little guys! 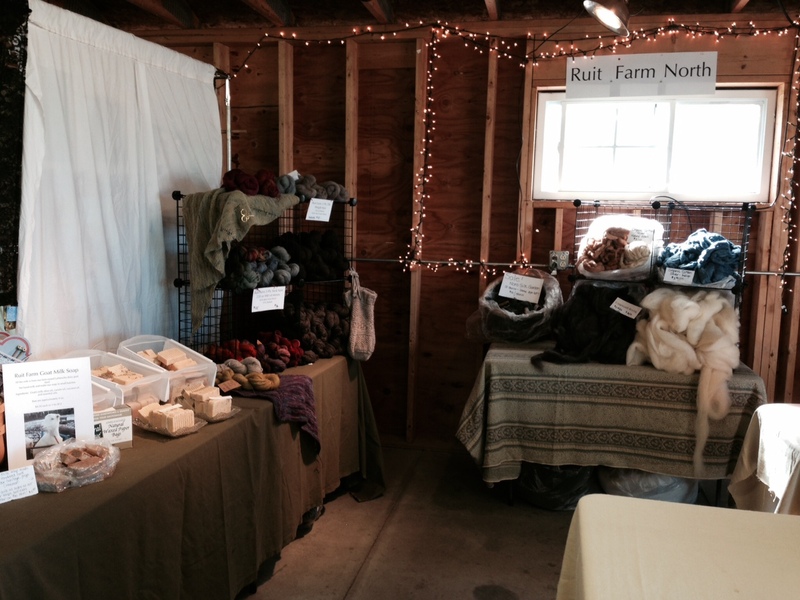 We had a gorgeous weekend for the Fiber Frolic of 2014. 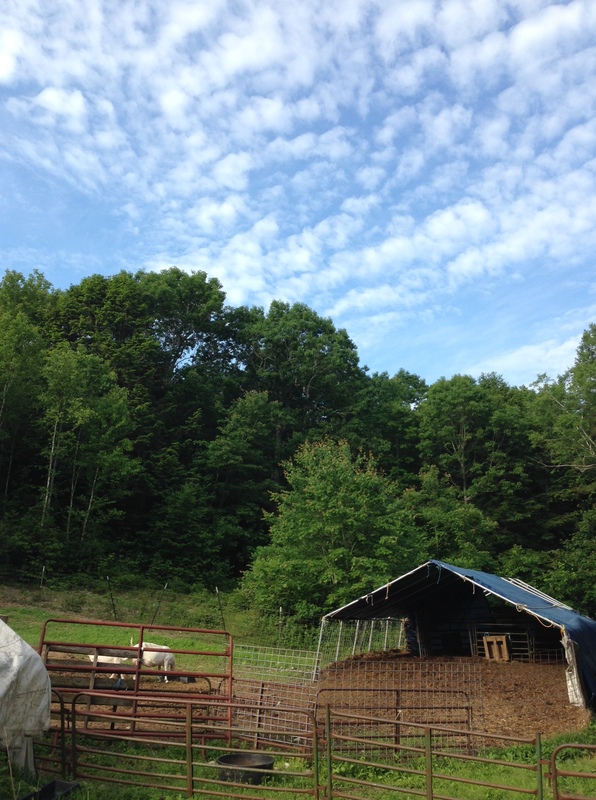 So beautiful, however, that it was over 80F and no one was really looking to be touchy-feely with wool! But the crowds were there, and it was lovely to see all our usual customers and visitors. A new booth neighbor to my left was just delightful, and by the end of the day today we were all eating homemade ice cream from the ice cream truck. Standing on a concrete floor all day is tiring, and it was good to get home and unload the car after I did chores and had a nice visit with the goatie crowd. It’s no longer the weekend, although I had great intentions of getting a blog post out by Sunday night. 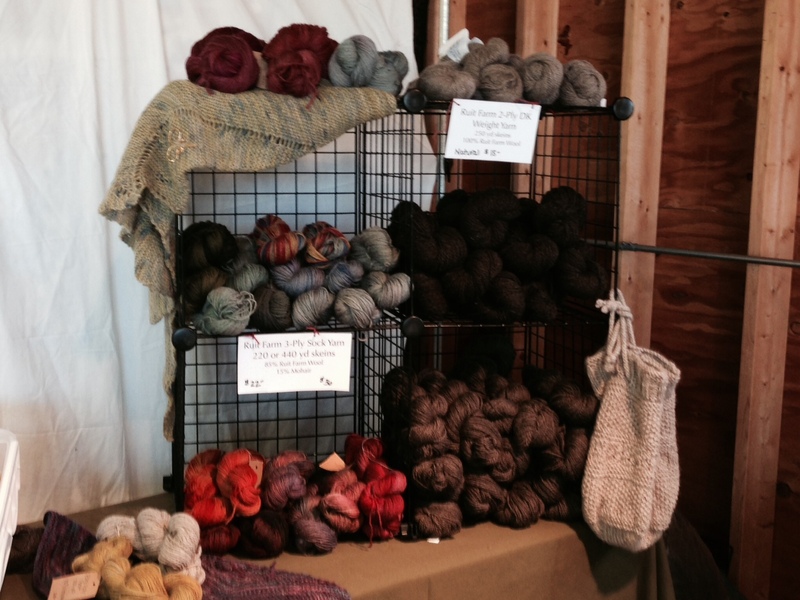 I am burning the midnight oil getting ready for this coming weekend’s Maine Fiber Frolic. I always think I am going to be better prepared to pack up my car on Thursday afternoon, in readiness to blast off directly from work on Friday to set up at the Windsor Fair grounds. But as usual, even yesterday afternoon, I was most definitely not prepared. One of the reasons that I am so ill-prepared is that about two weeks ago I discovered a wool-moth infestation in some fleeces I had upstairs in my fiber area. This is one of the fears that all fiber folk have, and sometimes even constant vigilance is not enough. Inside the freezer. The wool mess takes over! 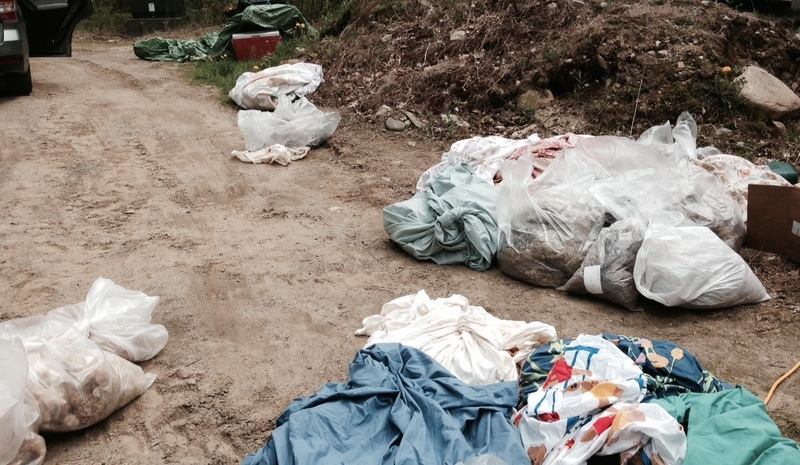 The offenders in my fiber loft were a few dirty fleeces housed in plastic bags that I had left open slightly so that they would not form condensation and felt. Near-hysterical panic set in and I had to weed out all the affected items. To start with, I just took everything outside and lined them up in the driveway for an inspection and sorting (thank goodness for a nice stretch of weather and a holiday weekend). 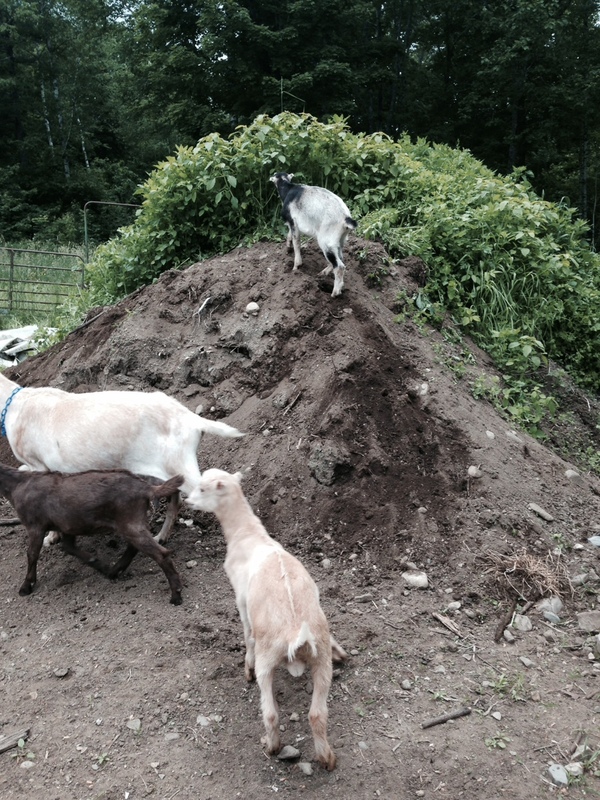 Anything that was infected went on the compost pile and John turned it under, many times. 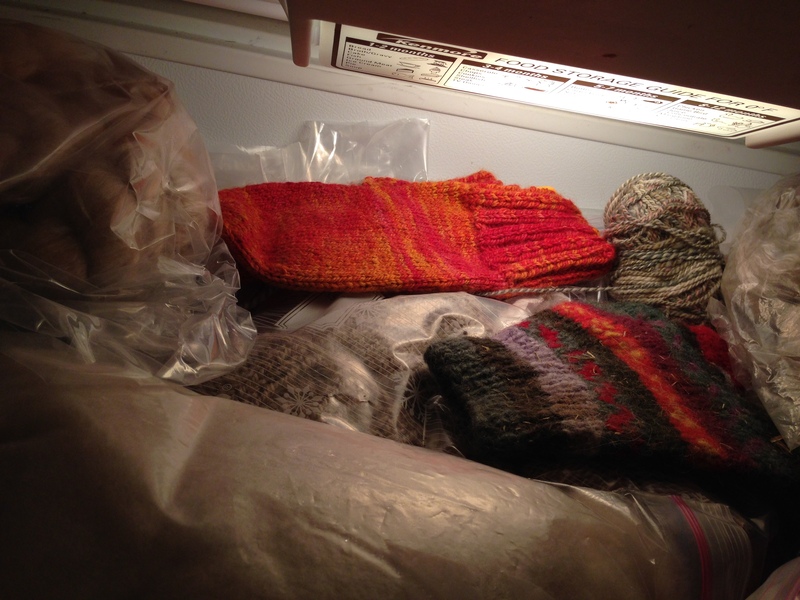 Everything else went into the freezer, and every day as I came home, I took more out and washed and washed, in extremely hot water, and then dried in the sun, not to return to the house until it was in storage bins. Interestingly enough, nothing that was wrapped up tightly in cotton sheets was affected. Nor was anything closed up in brown paper. The day after the gruesome discovery, a Saturday, good friend Chris came to my rescue and helped out all day, toting and organizing. Our driveway resembled a disaster zone, thank goodness not on a larger scale of any kind, like a real natural disaster. There haven’t been enough hours in each day for me to feel like I am not running faster just to keep falling behind. But anything going to the Fiber Frolic either was not in the house at the time, or has been washed to within an inch of its little life and put into containers. No more open-air wool hangouts in our house for sure! The upshot of it all is that I have a lot of fiber loft organizing to do. It’s time. The Weekend of the Wool Moth Warriors is over, but the battle and the preventive planning will continue for a long time to come. However, before anything goes back upstairs, even in containers, we are going to be doing some spraying. I hate chemicals and avoid them at all turns if I can, but I do not think we can eradicate lurking bugs without it. Ugh. I cannot believe that after almost a lifetime of living with wool and fiber products openly in our house, that we got hit. Luckily, the problem came to light before packing up for the Frolic. The alternative doesn’t even bear contemplation.